Rose Franzisz was born October 2, 1935 in Fort Vermilion, Alberta, Canada, the third youngest of 14 children born to Mary and Andrew Donecz. She passed peacefully in her sleep Wednesday, January 23, 2019, at the age of 83 while in hospice care at Brookdale Green Mountain in Lakewood, Colorado, USA. Rose married Egon (John) Franzisz and moved with him where ever his job took him. This included Haiti and numerous towns and cities throughout Canada until 1970, when they moved to Lakewood, Colorado. 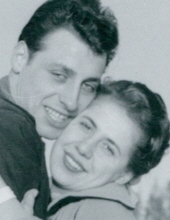 They settled together in Lakewood until John passed away in 2010, after which she remained in the family home, forever heartbroken without her beloved husband. She raised three daughters, Wendy Harris, Diana Kazmer, and Monique Franzisz, who remain near her home. Besides her three daughters, Rose is survived by five grandchildren, Jennifer Harris, Kristin Aimes, Egon Kazmer, Evan Ammidown, and Jaiden Miller, and one great grandchild, Jackson Aimes. She is also survived by two sisters, Ilene Paulovich and Kathy Braitenbach, and numerous nieces and nephews in Canada. Rose devoted her life to her husband, family and friends providing a wonderful home, love, and comfort to all who crossed her threshold. She was known for her fabulous meals, preparing lavish feasts for holidays, birthdays, summer barbecues, and other family events. She was highly accomplished at crocheting and sewing and used her talents to not only create beautiful outfits, wedding gowns and bridesmaid dresses, but to also reupholster furniture for her children, herself, and friends. To this day, her grandchildren fondly remember the delightful baby room/crib layettes she made for each of their births. A family celebration of her life will be held Monday, January 28, 2019, 3 PM at Ellis Family Services, 13436 West Arbor Place, Littleton, Colorado, 80127. To send flowers or a remembrance gift to the family of Rose Franzisz, please visit our Tribute Store. "Email Address" would like to share the life celebration of Rose Franzisz. Click on the "link" to go to share a favorite memory or leave a condolence message for the family.